German metal queen Doro Pesch has recorded the official "anthem" of the Wacken Open Air festival, which is celebrating its 20th anniversary this year. According to a posting on the event's official web site, the song, which is entitled "We Are The Metalheads", is "about the community feeling of the metalheads, about the power and the energy which is given by this music — and, of course, it invites you to sing along and to party hard!" "We Are The Metalheads" will make its debut on July 30 at this year's Wacken Open Air, where it will be performed by the German band SKYLINE (which once featured Wacken organizer Thomas Jensen in its ranks along with Wacken founder Gösy on drums) and Doro herself. The track will be available for purchase at the festival as well as via all popular digital music providers. All sales proceeds will go to charity organizations like Ein Herz Für Kinder ("A Heart For Children") and the Wacken Foundation, which supports young musicians and metal bands. 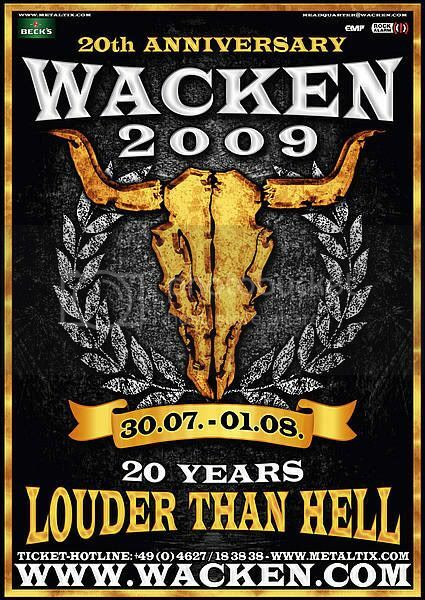 The 20th Wacken Open Air metal festival has been sold out for months already. But fans who couldn't get a ticket shouldn't despair, because the event will be streamed live via the music portal Rockalarm.de in collaboration with Tempodome. The transmission begins in the morning and goes on until the early morning. Gigs happening simultaneously on two separate stages will be filmed and broadcast one after the other. In addition to experiencing the concerts in top sound and picture quality, online fans will also be able to chat, vote and headbang in their own four walls. And the virtual road to the festival is well paved too: Tickets for the big weekend are on sale for various prices at www.eventim.de/wacken. The three-day pass guarantees at least 40 hours of live programme and costs 6.90 euros until May 15 ("Early Metalheadz" ticket), 10.90 euros from May 15 May to July 15 ("Wacken Rulez" ticket) and 15.90 euros from then on ("Headbangers Heaven" ticket). The organizers of the Wacken Open Air have joined forces again as they did last year to offer the live stream of the festival together: CTS Eventim AG, Europe's ticketing market leader, is handling the live stream tickets; the interactive live stream specialist Tempodome.com is responsible for the Internet broadcast; and Rockalarm.com, the portal for all fans of hard rock, will be presenting the stream exclusively on its web site. The exact schedule for the Wacken Online live stream will be published in the weeks to come.